I’ve always been a big fan of Noble Outfitters. It all started with some really great socks, and I’ve watched them expand their product lineup over the years. The representatives have always been super nice to me and pleasant to work with, and I believe they make quality product for riders. Because of all of this, I was pretty pumped when they asked me to review some products from their new fall lineup. 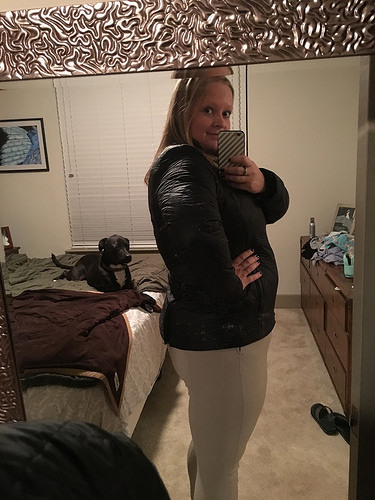 I picked the Warmup Quilted Jacket and the Classic Quilted Belt, and love them both! When you first glance at the product photos, this looks like an ordinary jacket. 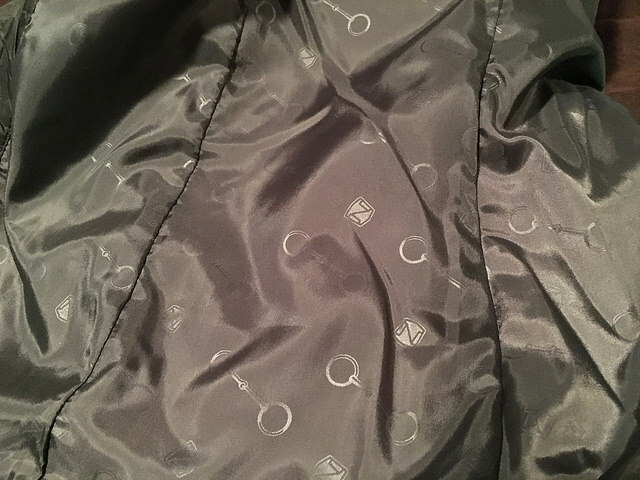 I was expecting the quilting to be on the thinner side, but was pleasantly surprised when I took the jacket out of the box. This thing is warm! The quilting is thick and comfortable without being bulky. In addition to the nice quilting and warmth, the jacket has a lot of details that show off its quality construction. The inside of the jacket is lined with a silky fabric that is designed with subtle bits. It’s a cute equestrian detail without having a giant appaloosa galloping through a rainbow embroidered on the back. 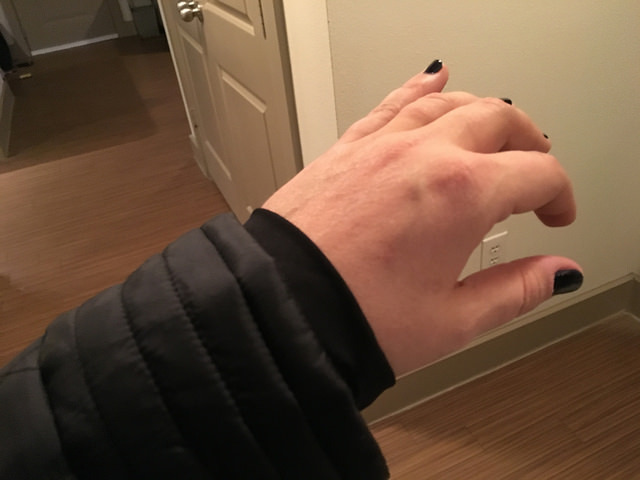 The quilted sleeves are capped at normal sleeve length, around my wrist, but they also have a slinky material that will extend further down your hand. You can even tuck your thumb through the fabric (this always annoys me so I opted not to) for a little extra warmth. Or open up the zippers for extra freedom of movement. I left them zipped, but it’s nice to have the option. Sizing wise, I was smack dab between their size options. I choose to size down, and although the jacket is snug I love the fit. When I ride I prefer a more fitted jacket than something that hangs and bunches. Noble Outfitters goes up to XXL on this item, so fluffier riders can get a quality jacket! I’m not someone who loves to pay full price for any clothing item, but I really do think this jacket is worth every bit of the $129.99 that it retails for. Look, we’ve all seen the original Tailored Sportsman quilted 2″ belts and oogled over their prettiness. Although I’ve oogled, I’ve never splurged because I don’t live in a world where I feel happy paying over $100 for a belt. Noble Outfitters has created a similar classic design, at a friendlier price point of $67.99. These belts come in classic colors, black and brown, but are accented with fun piping. I got the black with teal thread, and it looks fabulous with a lot of my bright colored tops. Sizing is true to fit, and the leather feels nice. The belt buckle is on the larger side, but it doesn’t bother me when I ride… which some larger buckles will when you have a muffin cake top! I like this belt. I think it’s cute. 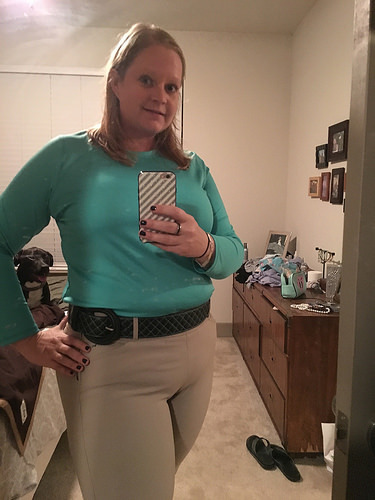 It looks great with TS breeches, and if you’re looking for something comparable to the TS belt without the TS price… this is a great option. I mentioned how awesome the folks are at Noble Outfitters, and they’re proving that to y’all by sponsoring a giveaway. You can win the Warmup Quilted Jacket or the Classic Quilted Belt in your size. Thank you Noble Outfitters! Woo hoo! What a great review. I’ve never seen those belts before but it’s super cute! You look so dang cute! sassy! Love it. Love Noble Outfitters! I have a review/giveaway coming up with them too 🙂 Good luck to everyone who enters! I saw this jacket and wondered how nice it was! Good to know someone has tried it, now off to add it to my Amazon wish list! I’ve been really pleasantly surprised with my stuff from Noble Outfitters too. Giving them a little more wear/use before I review, but so far so good! 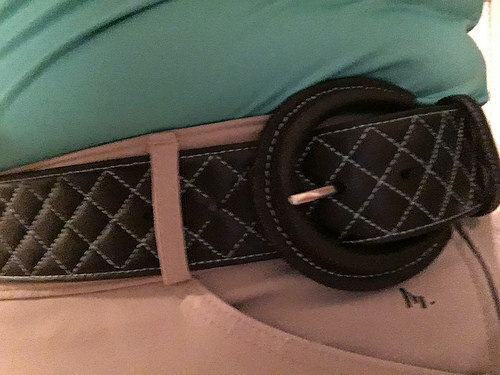 The belt is cute, almost makes me wish I had breeches with wide belt loops. I am obsessed with the Noble Outfitters peddies socks – they are the best! I think that coat is spectacular. Just judging from that I’m going to say that’s a favorite. If only because clicking through the site I can’t decide. I bought a black winter coat from them last year. It came with a scarf too! It was the most I’ve ever spent on a coat (probably more than double), but it was worth it. It is so nice! It’s warm and waterproof. So classy to! My fashionista, non equestrian sister even liked it! That jacket. I think its my favorite. I like the zippered back, though I think I’d only use that when riding. And I’d love the thumb loops for sure! I LOVE every single Noble Outfitters product I’ve tried! Just super well-made, thoughtful products that function in the real world. The Peddies socks are the greatest invention ever, and I have their 3/4 sleeve technical shirt in 2 colors. That quilted jacket looks gorgeous. I love the looks of their gloves – I am eternally on the quest for the right gloves and I love the styling and colors of theirs. Since it’s getting cold here, that quilted jacket looks awesome. and have to sling bales! I loveeee my Noble Outfitters ringside pack and their Peddies socks—two show essentials I can’t live without! That jacket looks so cute on you, and I like how it can double as a classy out and about around town jacket without, as you said, outing yourself as a psycho horse person. I love noble outfitters stuff. I now have two of their Sierra zip up hoodies and a cowl neck pullover as well as ton of pairs of their socks. I’m so thankful that they believe in people with big feet (there are large size socks) and long arms! I am loving that jacket! I’ve been looking a non-bulky but warm quilted jacket. Thanks to you and Noble Outfitters for the giveaway! Just clicked through to read your review on the socks. They sound like the perfect solution for me. I love my Zocks, but after a catastrophic leg injury, I have a lot of metal in my leg and the Zocks don’t provide enough padding around the screws and sometimes I get rubs there. A little extra padding in the foot and ankle but still super cute on the calf sounds ideal for me! So I really love the jacket, cause I’m kinda addicted to jackets, but that belt is also pretty. Since I wear front zips, I’d worry that I’d take the buckle to the gut dismounting. I wore this belt my previous ride with front zips, and the buckle didn’t bother me at all. I LOVE Noble Outfitters and so glad they have expanded into western wear! I adore the Rock & Roll Denim Shirt and the Tough Girl Canvas Jacket! But, I think my absolute favorite new thing is the classic quilted belt you are wearing … LOVE! I am big fan of their socks. Over the Calf peddies, hello! I want padding on my feet and thin over my calf. Love them. I have a pair of Noble Outfitter’s ready to ride gloves for schooling, I really like the fit and that they aren’t bulky. That being said, I’m a bit of a jacket hoarder so I’d love to try the quilted jacket! That jacket looks GREAT on you, BTW! Oh that jacket is SO cute!! The only NO product I’ve tried was the wound care and I really like it. It didn’t sting like some other products do, so my animals didn’t try to flip out when I sprayed it. I’m actually loving that jacket. But I also decided just recently that maybe vests aren’t so weird and I might like one, and that Radius Insulated Vest is really nice and looks super comfy. I really love that belt! 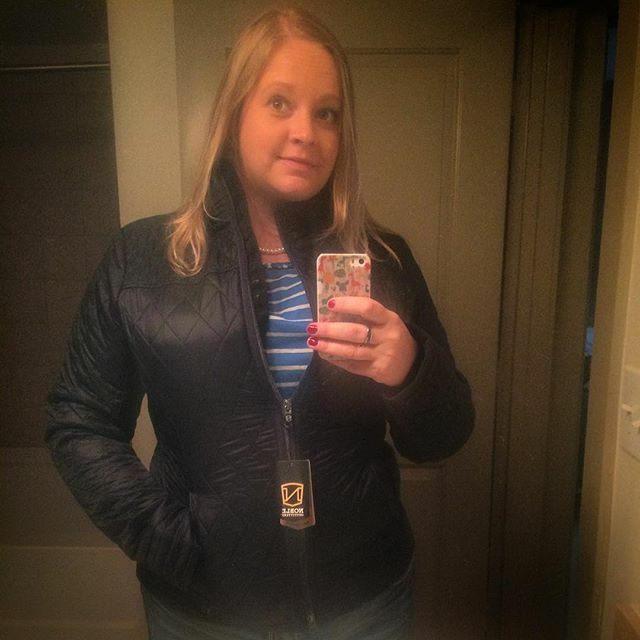 My favorite Noble Outfitters product is the quilted jacket! Oooh, I MUST have that jacket! Love it! I really love the Noble Outfitters Balance Kneepatch Riding Tights. They are soft and stretchy and they have an awesome pocket on the thing instead of in the crease of your hip which is perfect for holding a cell phone. I really love their stuff! They keep coming up with more and more great items. I would like to have their Canvas Tough Girl Jacket. Between the racetrack and the dressage horses, it would be perfect for me and is getting added to my Christmas list. Not that the fiancé will definitely get it for me, but one can always hope. Oops *Girl Tough Canvas Jacket. Loving that jacket. Definitely going ton the wish list. I’ve never actually used or have anything of theirs because I am broke but honestly that jacket looks phenomenal. I looked through the website too and the breeches they have listed look classy and for under $90, pretty good deal. Also really in love with their quilted warm up coat. Been on a long coat kick lately. Would be really cool to win that jacket;) ! I never have on anything before, despite always entering contests haha! I love the quarter zip riding shirts! I love their socks! And that jacket is really cute too! I would love to win the jacket or the belt! I love my Noble Outfitter’s socks. I have pink and black zebra striped gloves that I love and are wearing really well. I would love to win that jacket! I have a pair of Noble socks I got at Quarter Horse Congress many years ago when they were just first starting up, they weren’t actually selling anything yet. Not only are they still holding up, they are in good condition! People think I’m nuts, but my FAVORITE Noble Outfitters item is my gloves. I have the Perfect Fit ones in Blackberry (because that’s the closest they had to purple) and I wear them religiously when I ride. How can you not love a glove that lets you grip the reins, or dink with your smartphone AND doesn’t make your hands sweaty in the Texas summers? I’ve had them since April or May and have probably logged well over 100 miles with them. And I’ve drenched them in rivers (well, okay, so there’s that ONE time my horse laid down in the river), gotten them wet from all sorts of icky water, rinse them and they’re still holding up. Have I mentioned how much I LOVE my gloves? Although, I sure would love a nice warm jacket. Now that the weather’s getting colder, I’m getting tired of wearing all of my ugly sweatshirts and hoodies to the barn. Oooh, I like that jacket! I don’t think there is an item that I don’t like made by them. I was lusting after that belt just the other weekend, but I would really fancy one of their fun show shirts! I LOVE Noble Ultimate Support Boot Sock & the Best Dang Boot Sock – both are awesome!!! Love the warmup quilted jacket! I love love love those belts! My favorite noble product are the boot socks with reinforced foot (I think they call them peddies? ), they are totally amazing! I have always bought their riding gloves. They last a long time and they are one of the very few gloves that fit my child sized hands well! Lol. That quilted jacket is cute! I bet it is comfy! So I actually bought a zip top they discontinued a while back and I freaking love it. The closest I can compare it to is the Lauren Quarter zip, which I seriously want to buy right now. You know, of the small number of items I have from Noble Outfitters, I really like them all! I hope I entered right. The First crush cowl looks supremely comfy. I love Noble’s tall boot socks with the extra cushy footie bottom – and that jacket is super cute too! ooh i like that jacket! it all looks great on you too! i’m constantly ogling the NO stuff at tack shops but have never actually taken the plunge and purchased anything. maybe one day? That jacket looks SO nice. It’s hard to find warm comfy jackets that aren’t horrendously bulky for riding. As for favourite products, Kelsey gave me the Wine Down hoofpick for Christmas last year and I’m still not over the fact that it exists and that I own one. It just makes me happy. My favorite Noble Outfitters item… That hoofpick that’s also a wine bottle opener. What’s better than that?! The jacket is very flattering and the zips are a nice touch for unrestricted riding. I have the noble outfitters grooming tote and I adore it! It is so spacious and accommodates all my needs. The fabric and structure is super durable, which is a must for me because I drag it everywhere! All the pockets are a godsend , and the attachable shoulder strap is fantastic. My favorite feature to top the rest is the central compartment which holds all my spray bottles in an upright position so that they don’t leak. This is the only tote I have found with this feature! Love love love this brand! Definitely the Noble Outfitters Boot Socks! Very comfy for my arthritic feet! I love the jacket! I’m fluffier in body type so something that’s sleep and warm is fantastic!